What happened to the girl you left behind? In 1916 French artist Edouard Lefevre leaves his wife Sophie to fight at the Front. 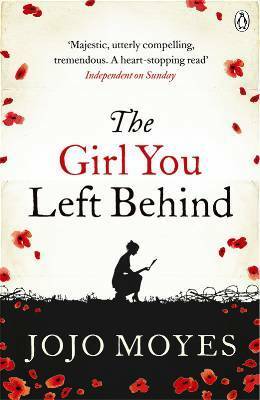 When her town falls into German hands, his portrait of Sophie stirs the heart of the local Kommandant and causes her to risk everything - her family, reputation and life - in the hope of seeing her true love one last time. I must admit I started this book and I wasn't sure if I'd like it in the end but actually I kind of loved it. The story is split between the past and the the present. 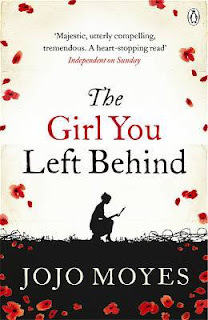 In the past you have the story of Sophie who is living under German rule in France during World War One and forced to serve the men whom her husband is fighting against. Her story is a really intriguing one and one I knew very little about despite having studied World War One extensively over the years. I enjoyed the characters and the excitement of the story and was left wanting more about the time period. The other part of the story is set in more recent times connected to the past events via a painting of Sophie which has ended up in London on the wall of Liv. I won't go into too much detail about the link but I really loved Liv's story. She is very much a broken soul at the start of the book and I enjoyed seeing how that changed as the story went on as she started to get a bit more fight into her. I loved the two new relationships she starts to develop within this book which are both completely different but completely what she needed to get her back into the real world again. I particularly loved how her story became connected to Sophie's and I loved finding out more about Sophie's story through Liv.